Jessica Hernandez & the Deltas headline Soda Bar Friday, July 10. Hot on the heels of her two new singles, Detroit’s Jessica Hernandez is hitting the road this summer and will make a stop this Friday at Soda Bar. The Mexican-Cuban is a musical force to be reckoned with -- totally self-taught, she rocks any instrument from drums to guitar. Hernandez’s energetic work-hard-play-hard spirit is winning critics over every time she performs. She even got David Letterman to react with utter amazement after a "Late Show" performance by saying, "That voice!" On May 19, Jessica Hernandez & the Deltas released a hard-hitting blues rock cover of ‘90s electroclash band Le Tigre’s "Deceptacon." Its B-side is an original song, "Don’t Take My Man To Idaho," which includes a funny recording from a guy calling himself "Paul Wall." And nope, it's not the rapper. "That is actually my boyfriend calling me from jail the first week we started dating," Hernandez jokingly admitted on Reddit about her now-fiance, Kyle Straka from the Growlers. "The 7" is one of my most fun releases to date," Hernandez told Paste Magazine. "It’s made up of a funny song I wrote about cocaine stealing my man and a cover by Le Tigre, one of my favorite bands as a teen." Her most recent music video "Sorry I Stole Your Man," is a super fun, tongue-in-cheek party scene paying homage to her Mexican roots a la Detroit. Hernandez has always stayed true to her roots -- and can show Donald Trump a thing or two about what it means to be a real, humble American. Hernandez recently showed support to America Ferrera’s Huffington Post article, "Thank You Donald Trump," by sharing it on her Twitter account. Hernandez, too, says thank you because Trump’s diatribes have indeed reinvigorated U.S. Latinos to speak up and swing into action for next year’s election. On Facebook, she posted proudly for Independence Day: "Happy 4th of July everyone!!! Pretty grateful my family decided to come to this country and build a beautiful life and give me the opportunity and freedom to live a life doing what I love." 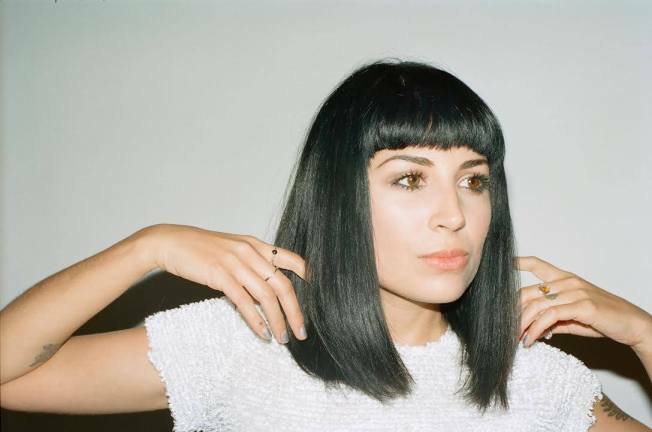 Jessica Hernandez & the Deltas headline Soda Bar on Friday, July 10. Get your tickets now. “Like” her on Facebook. Jessica Hernandez & the Deltas get "Caught Up" during their recent headlining show at Soda Bar -- and prove why they're the next big thing out of the Motor City.